The lip on the clamp is regulary sitting on the top of seat post. Not mine. No clamp will fit. It is a 21". A knowing problem? 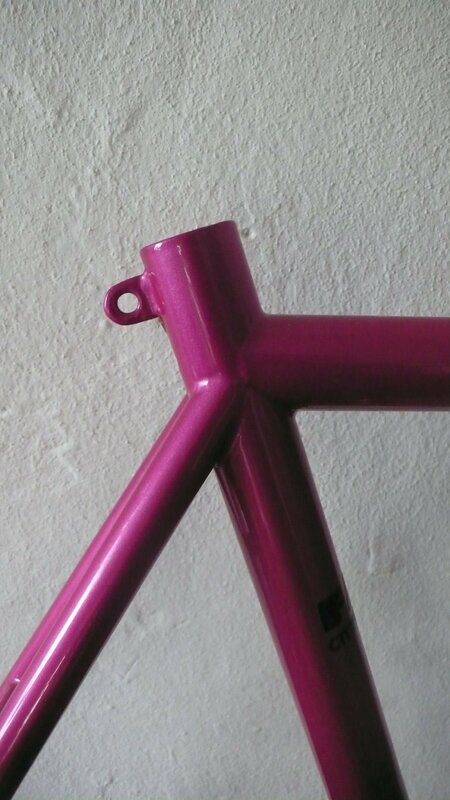 Or a mistake by the framebuilder? I need help. Please. The original design of the seatpost clamp did not sit on the top of the tube the way the later clamps with the seal did. I believe I had to modify the fixture that held the seat tab in place while it was welded to the tube to properly fit the newer clamp. If you look at some photos of older Fats, you can see the top of the seat tube sticking up through the clamp. You will have to find an older style clamp to fit the tab location. A possible solution would be to carefully grind down the top of the seat tube (maybe use a broad hand file to keep the top of the tube as square as possible. Use tape to protect the paint. to cut the seat tube is no solution for me. to find an "old"-style clamp is nearly unpossible. i think i will modify my salsa seatclamp. thanx a lot. tried to modify a salsa-clamp in 28,6 with a dremel. it fits the seat tube. but the screw did not fits the lip. ****. have to try the hershey racing ones.